You can tell that the political excitement has faded – at least for the moment, thankfully – when I have to return to blogging about mundane topics. After a two-week interruption because of the protests and their aftermath, I finally concluded an errand to the Nissan dealership. Our Cefiro, pushing a dozen years old, is starting to have all the little aches and pains that accompany aging. In this case, it was a dead window motor. Normally, that wouldn’t be much of a problem, considering that, generally, the weather here in Thailand and, specifically, the polution here in Krunthep rarely allows for windows-down driving. But it was the driver’s window motor that had died and at every expressway toll booth and the entrance to every car park, I had to open my door and reach over it to pay the toll or receive my parking ticket. I felt like the driver of one of those old taxis around town, whose windows no longer roll down. To get a new motor would have taken twenty days (shipped from Japan!) and would cost 6,000 baht, about US$ 185. Thankfully, the dealership was able to locate a second-hand motor and installed it for only 1600 baht. The expression “second hand” exists in Thai just like in English. Literally, “hand two” as there are no ordinal numbers in Thai. The dealership pointedly explained that they would only warranty “hand two” parts for seven days after installation. What do you want to guess I’ll be blogging about in another two weeks? Since our car has been showing more signs of aging, we’re starting to consider what would be an appropriate replacement vehicle. While I like the size and comfort of a midsize car, I don’t think they are very practical or economical when driving here in Krungthep. With the amount of time one spends sitting in traffic, a hybrid would be a great choice. Unfortunately, the Toyota Camry is the only hybrid sold in dealerships here and it is very pricey. The March has received good reviews in the local auto press and gets high marks for value when compared to the Suzuki Swift, Honda Jazz, and Toyota Yaris in the B segment and Cherry A1, Proton Savvy, and Kia Picanto in the A segment. Technically, the March is a B segment car but with a slightly narrower body than most B segment vehicles. At about a half-million baht (US$ 15,600) it is relatively affordable. 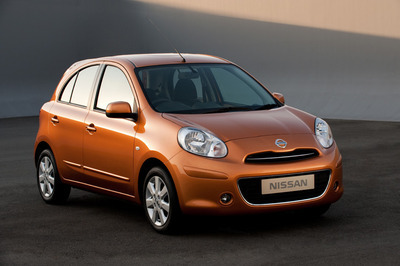 I think it is cute enough although not great – I prefer the Yaris. The size is small enough for the narrows sois of Krungthep. Still, I’m not ready to do any serious comparison shopping. It is enough to just start thinking about potential candidates. This entry was posted in Uncategorized and tagged Automobiles, Cars, March, New Car, Nissan, Vehicles by christao408. Bookmark the permalink. Hey Chris, that’s not the right picture! That’s the old March! @Poomsira – Okay, thanks for pointing that out. I’ve changed the image to something current. Well, at least I think it is current. what is this a and b segment? I just got a Suzuki Swift! It’s great but a bit expensive and relatively gas-guzzling for a car of its size. after the last few weeks of “excitement”, it is great to be able to have the mood to think “mundanes” again. I have been wanting to buy a hybrid and I agree that a hybrid would be perfect for Bangkok. However, the premium they charge for it is just insane. I like Swift… it’s a popular car here. @murisopsis – I think they are models that are available more in Asia than in North America. The Fit is, I think, the same as the Jazz. Cars aren’t my area of expertise. @Dezinerdreams – @Poomsira – The Swift is a good-looking car. K. Poom, what made you choose it? @stevew918 – Yeah, I want to be an early adopter but it has to make financial sense, too. @M_1 – Good question. The refer to the different sizes of the cars with A being the equivalent of a sub-compact, I think. Here’s an article about it. I bought my first car about 3 years ago. I realized that I don’t like car shopping too much. It can be completely overwhelming. We’re thinking of changing our car (Mitsubishi Virage) too, since it’s already about 7-8 years old. We’re considering Mazda 3. I start thinking about getting a new car too, not soon tho. Is that the color you are getting? thanks for blogging from where you drive in your Nissan car with a “new” window motor, and for reports on that and maybe your next car, etc. It is so funny reading about your possible car purchase. You sounded just like your dad! “We’ll start looking but we won’t actually decide on a car for another five years… ” hehe hehe I guess I’m impulsive in your eyes. I check out the auto show in November, sit in all the small SUV’s there. By December when GMC has a sale with 0% financing I buy one. That was in 2001 and I still love it! Go figure. Boy, the March sure has changed a lot since I last saw them in Taiwan. You don’t like the Honda Jazz? I didn’t think it’s in the same “class” as the March or Yaris as it seems a little bigger than those two. @christao408 – SUV. Any suggestion? @foggysunnymorning – My parents have a Honda CR-V and I’ve driven it a few times. Seems like a nice car on the smaller end of the SUVs. @christao408 – I know Honda CR-V is a nice car, one of my friends has one. I prefer a bigger and safer car because I like road trips. hehehe…I was visiting Toyota website when getting your comment. @foggysunnymorning – Toyota RAV4 is now a bit bigger than the CR-V and could hold more. If you want even bigger than look into the Highlander. @christao408 – Interesting. I thought the Jazz is the same as the Fit here.Here’s the U.S. Fit technical spec:http://autos.yahoo.com/2010_honda_fit_5_spd_at-specs/And here is the U.S. Yaris 5-door (I assume you’re looking at 5-doors)? 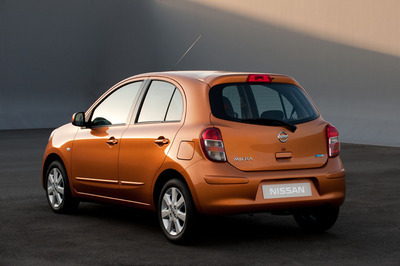 spec:http://autos.yahoo.com/2010_toyota_yaris_liftback_5_door_at-specs/Different engines though. Both of these come with 1.5L in the U.S.
@yang1815 – I think the Jazz and the Fit are the same car. What I meant by the Yaris being a hair larger than the Jazz is my perception when sitting in the driver’s seat. More experiential than technical. my favorite color but nissans have skinny seats honda is much more generous in their seat width and don’t put nitrogen in the tires so you have one more thing to buy. I think the Jazz / Fit have more usable storage space than Yaris? Aaron has one – maybe you can check with him to get his impressions. @christao408 – Ooo got it. Do you guys have Smart cars in Thailand? I like the Smart ForTwo because it’s always pretty economical (even though it similarly lacks a hybrid set-up, etc). Ooh! Do you guys have the new Nissan Leaf coming out? Pure electric (no gas!). I have a Honda Civic Hybrid that has proven very reliable for the past 3 years too (not sure if that’s sold there either…). Have fun and take pictures of the cars you have in mind! I need a car too! you know, if the global warming is getting worse and we supposed to be more protective of our earth, then why every government of every country is not restricting the price of so-called hybrid car so that the rest of us people can afford it? i mean, HELLO! car companies. do you want us to buy your car and save the earth, or not? @ElusiveWords – I’ll have to do that. Thanks for the suggestion. @rudyhou – Well, part of the problem is that the hybrids are quite expensive, especially the batteries. Governments are providing tax incentives to help offset the additional cost, but even then you still have a product that is more expensive that a regular car. Now, if we started taxing gasoline more heavily (at least in the US) we would make the hybrids more competitive on the basis of usage costs. @kenpcho – Smart cars, along with a whole host of other cars, are only available through unofficial import channels. In other words, no dealers and no repair shops for them. Very, very expensive. If the Civic Hybrid was available here, I would buy it in an instant. Unfortunately, right now the only hybrids are on the Camry and some larger vehicles. People who are going to buy smaller cars in Thailand don’t have the money for a hybrid. Did I ever tell you why I chose Swift? Looks alone! Well, it kinda look like a Mini, that’s why!It drives pretty well, albeit a tad sluggish and a bit too fuel-thirsty compared to the more common Jazz/City/Yaris/Vios crowd.It drives pretty much like a European car, very reassuring at high (160+) speed on the highway.